According to Nielsen, 85% of people who have tablets use them while watching television. The report also claims that 30% of tablet use happens while watching television. So many screens, one is bound to have something interesting. 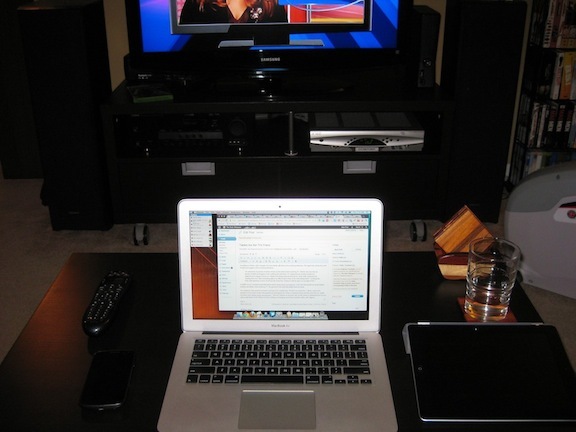 At SXSW 2012, I watched a panel discussion about “three screen convergence,” or the idea that people are using laptops, mobiles and tablets while watching TV. The panelists were positively giddy about the trend. Two moments of the panel have stuck in my head over a month later. The first was when Eric J. Bruno, senior vice president of Consumer Product Management & Development for Verizon Communications told the crowd that he, “geeks out about DRM (digital rights management).” That isn’t relevant to my point, but I’m still trying to understand how he was able to utter those words without his brain melting and dripping out of every available orifice. But I digress. The second, and much more relevant moment was when Soraya Darabi spoke about everyone’s favorite “screen convergence is great” moment, the Superbowl. The panel was abuzz about the Superbowl, and similar national experiences where most or many of us are watching one thing at the same time. Ms. Darabi spoke of the hilarious tweets she saw cross her feed during the Superbowl and awards shows. She just loved the sarcasm and comedy from those she follows.The panel thought this was great too. Their collective conclusion is that social media commentary while watching a television program equals positive engagement. I’ve often used my mobile, tablet or laptop while watching television. The only times I ever do are when I am disengaged. When I’m watching something that someone else has selected, and I’m either not interested or in the case of Grey’s Anatomy, doing my very best to resist the urge to permanently damage my ears just to make it stop. When I’m watching Breaking Bad, The Walking Dead, Mad Men or Boardwalk Empire the last thing that I want to do is miss a single second of the show. The only time I’ve ever touched another screen is to look up some reference from the show, and if I do, I’m hitting pause first. The people tweeting funny things about the Superbowl and awards shows aren’t engaging with the show that they are watching, they are coping with the fact that they are stuck watching it. They’re the bored friend dragged to the Superbowl party, or the spouse stuck watching the Academy Awards. They are using a different screen as an escape, and looking for sympathy from their followers. Old guard media executives can pretend that this trend is good for them, but it’s just an exercise in self-delusion. Update: I found this just after publishing. This study, is remarkably in line with what I just wrote. Full Disclosure: The Three Screen Convergence panel at SXSW 2012 was organized by a personal friend. It’s a two screen world these days. I agree with this completely. I’ve played around with various “augmentation” apps like Miso and Umami, but if I want to watch TV then I’m probably not paying much attention to any other devices I happen to have. If I’m paying attention to them, I’m not watching TV. Maybe I lack that particular skillset! I have no desire to read funny tweets while I watch TV, either… MST3K did it better than Twitter ever could, after all. I totally agree about Mystery Science Theater! You can’t top that.